Economist Steven Landsburg famously claimed that economics can be defined in two words: “incentives matter.” For Landsburg, all else is commentary. In a 2013 book entitled The Why Axis, Uri Gneezy and John List explore in detail how incentives matter. Characterizing economics as a behavioral science, they seek to understand what affects individual behavior based on exploring various incentives and contexts. In particular, they use field experiments to illuminate which incentives matter and how through examples drawn from a number of policy areas including child day care, school performance, charitable giving, gender-related compensation, and health care. For more including a few examples, go here. The post title is, of course, from the late, great Jacob Viner, who tells us that it isn’t totally easy to characterize exactly what it is that we economists do. The alive, possibly great Daniel Hamermesh from the University of Texas has been making some headway on cataloging exactly what that is. And, increasingly, it appears that the top journals are featuring more empirical work and less theory. Is this part of the big data revolution we’ve been hearing so much about? Potentially more interesting is that experimental makes up almost 10% of the total. 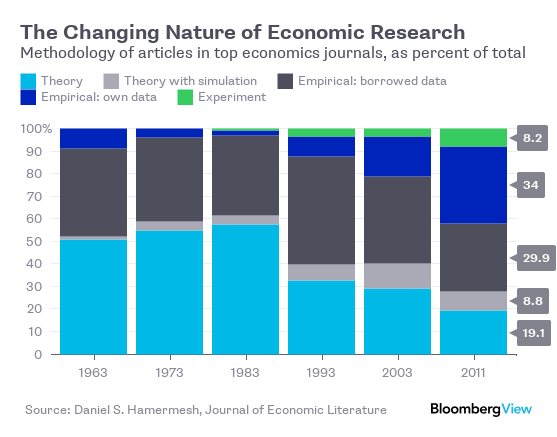 * Actually, Hamermesh published the paper several years ago, but I guess the news cycle is slow getting around to reading the Journal of Economic Literature. The 2015 edition of the eponymous Which Famous Economist are you Similar to? interactive tool is now available, and once again — though once again I probably shouldn’t be telling you this — yours truly has been paired with Daren Acemolgu. (Acemoglu, as you possibly know, is the MIT superstar economist who is the subject of the Daren Acemoglu Facts tumblr page, chock full of economist “humor”). As far as the Which Famous Economist site goes, the data are from the University of Chicago’s IGM Economic Experts Panel, which periodically surveys many economists on issues of the day. The matching is done via principal components, which is somewhat ironic, given principal-component modeling isn’t really part of the economist’s standard canon of quantitative tools. If you decide to take the poll, I recommend that you leave the questions you haven’t thought about (or don’t know anything about) blank. The authors say that “accuracy” requires at least 20 responses out of the 30 questions. 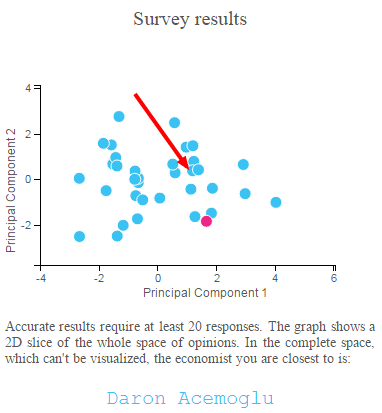 I’m the red dot, and the arrow points to Professor Acemoglu. Robert Hall and José Scheinkman are the dots closest to mine, and you can read the explanation for why I was not paired with one of them in the figure’s legend. The site also allows you to highlight where your views differ from the consensus view (I have a higher opinion of my peers’ knowledge of book prices, for example.) It also contains a correlation matrix for each economist in the survey pool — all are positively correlated! With more data available than ever before and markets increasingly unpredictable, U.S. companies—from manufacturers to banks and pharmaceutical companies—are expanding their corporate economist staffs. The number of private-sector economists surged 57% to 8,680 in 2012 from 5,510 in 2009, according to the Bureau of Labor Statistics. In 2012, Wells Fargo had one economist in its corporate economics department. Now, it has six. The key to the revival of in-house economists, companies and economists say, is the need to digest huge amounts of data—from production volumes in overseas markets to laptop usage in urban areas—to determine opportunities and risks for companies’ business units, not just in the U.S. but around the world. People often ask me: “Noah, what career path can I take where I’m virtually guaranteed to get a well-paying job in my field of interest, which doesn’t force me to work 80 hours a week, and which gives me both autonomy and intellectual excitement?” Well, actually, I lied, no one asks me that. 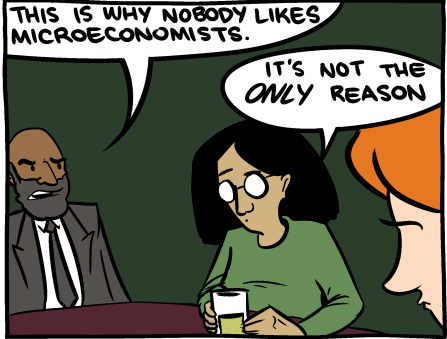 But they should ask me that, because I do know of such a career path, and it’s called the economics PhD. 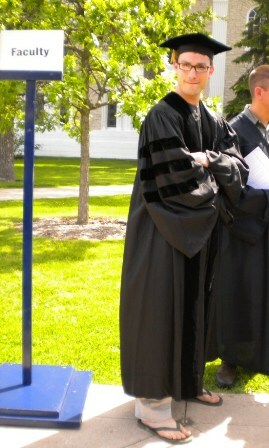 To which I respond: There are PhDs, and there are PhDs, and then there are econ PhDs. The emphasis is mine and I scrubbed the links, but the sentiment remains. A highly recommended read for the thinking-about-a-Ph.D. set. 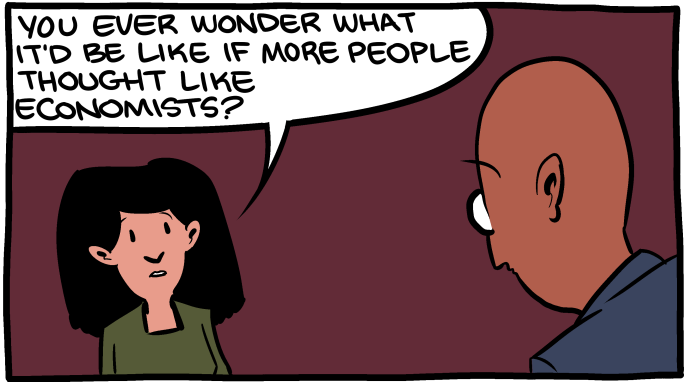 When the indefatigable Saturday Morning Breakfast Cereal weighs in on economists, hilarity ensues. 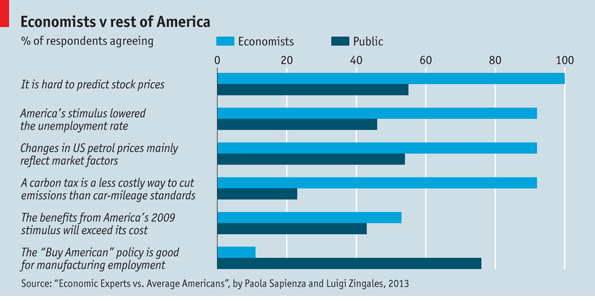 Economists are further ridiculed here and also here. Oh, and here, too! We are somewhat more heroic in this piece, I’d say! (For an explanation of the value of a painting vs. the value of grandma, see here. And then see here). Thanks to Mr. T. for the tip. That’s from “Rise of the Celebrity Economist,” at Salon.com. If you have to ask why, then my guess is that you aren’t going to get a very flattering portrait. Continuing our series of posts about what economists believe, my colleague reminds me of the list at the beginning of Deidre McCloskey’s text, The Applied Theory of Price, available free for download! If gasoline is taxed to conserve energy, will the quantity consumed go down by a nontrivial amount, despite the protestations of drivers that they cannot do less than the amount they are now consuming? Was the rise in the standard of living of the American worker over the last 50 years chiefly a result of better knowledge and more machines rather than of activity by trade unions? Is the American Medical Association, far from being a benevolent organization set on improving medical care, in fact a monopolistic trade union like the plumbers, longshoreman, and electricians? Does the resting place of the burden of the social security tax depend exclusively on how workers and employers react to a change in wages, and not at all on the legal division of the tax (paid half by workers, half by employers)? Is there an optimal amount, greater than none, of polluted air and water, noisy streets and airports, and ruined countrysides? Although the text was written more than thirty years ago (! ), the policy issues still seem rather germane — the burden of social security taxes, energy conservation, rising standards of living. I like the bit about the longshoreman. McCloskey does not weigh in here on drug legalization, but my guess is that she would argue that economists would agree on certain aspects. First, decriminalization or legalization would definitely lead to more drug use, due to both supply and demand increases. Second, the level of violence associated with organized crime and others would decrease. What there appears to be no consensus on in whether the goods outweigh the bads, or if the distributive implications are desirable, or even whether we want to be a society that “endorses” drug use. That, my friend, is the classic positive v. normative distinction. Do Economists Favor Drug Legalization? 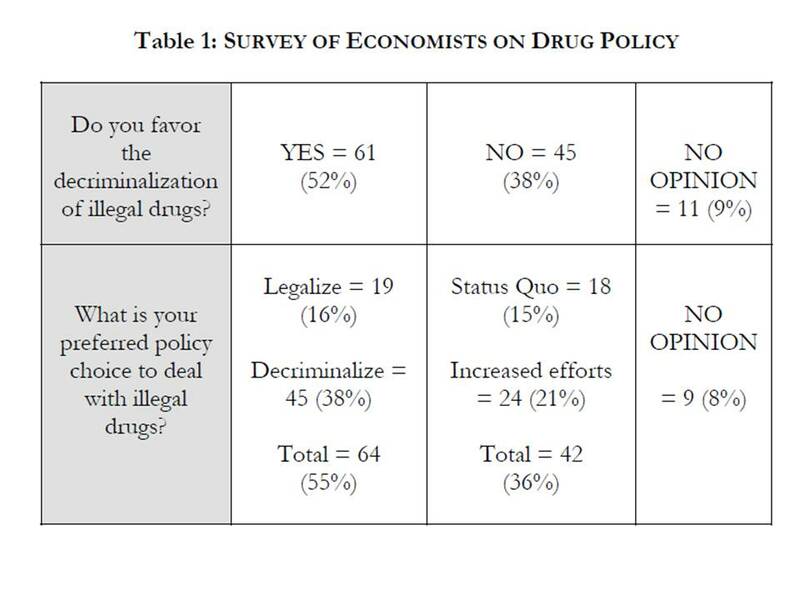 A random survey of professional economists suggests that the majority supports reform of drug policy in the direction of decriminalization. A survey of professional economists who have published on the subject of drug prohibition and expressed a policy judgment indicates an even greater consensus which is critical of prohibition and supportive of policy reforms in the direction of decriminalization, and to a lesser extent, legalization. Thorton concludes that there is in fact no consensus, and after taking a look at his summary statistics, I’d have to agree. That said, it does appear that there is solid support for some form of liberalization. You can check the article to see some snippets from “vital” economists such as Robert Barro, Gary Becker, David Henderson, Jeffery Miron, and William Niskanen. Posted on July 28, 2012 July 29, 2012 Author David GerardCategories General InterestTags Drugs -- Licit and Illicit, Economics is what economists do1 Comment on Do Economists Favor Drug Legalization? Did you just say we should eliminate corporate taxes? You have probably heard about the exasperated President Truman asking for a “one-handed economist” because all of his economics advisers were prone to saying “on the one hand… on the other hand.” Or, perhaps you’ve heard of the First Law of Economists: for every economist, there exists an equal and opposite economist (with the Second Law of Economists being that they are both wrong). Or, you might have even heard that if you were to lay all economists end-to-end, they still wouldn’t reach a conclusion. Hilarious, indeed, and fair enough, it’s true that our profession is prone to qualifying our assessments. But as a recent NPR Marketplace segment uncover, there are some thing views that seem to hold from east-to-west, from north-to-south, and, yes, from left-to-right across the profession. Three: Eliminate the corporate income tax. Completely. If companies reinvest the money into their businesses, that’s good. Don’t tax companies in an effort to tax rich people. Four: Eliminate all income and payroll taxes. All of them. For everyone. Taxes discourage whatever you’re taxing, but we like income, so why tax it? Payroll taxes discourage creating jobs. Not such a good idea. Instead, impose a consumption tax, designed to be progressive to protect lower-income households. Five: Tax carbon emissions. Yes, that means higher gasoline prices. It’s a kind of consumption tax, and can be structured to make sure it doesn’t disproportionately harm lower-income Americans. More, it’s taxing something that’s bad, which gives people an incentive to stop polluting. The catch, of course, is that politicians tend to not like these policies. You can listen to the full NPR segment here. 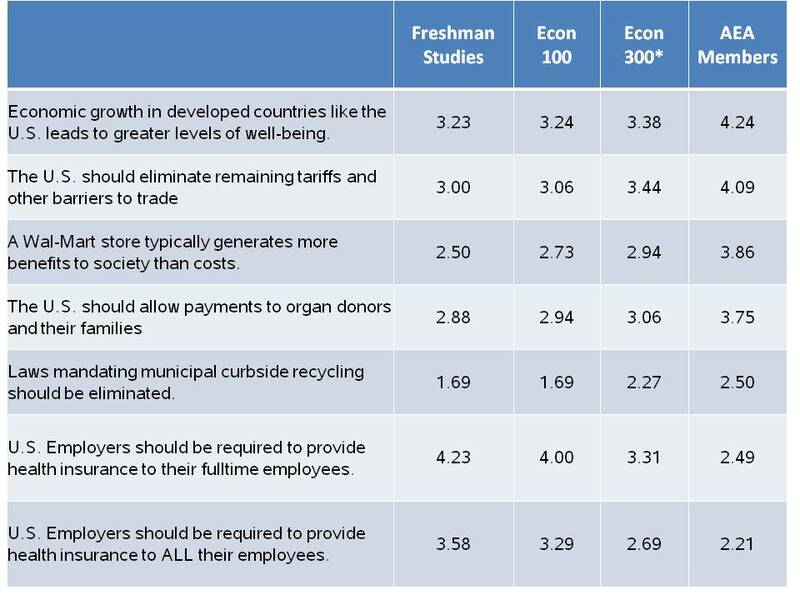 For more on what economists do and don’t agree on, you might check out this survey from Robert Whaples at the Econ Journal Watch. "Economics is as Economics does!" As I was preparing for Econ 100 for next term, I came across a piece by Roger Backhouse and Steven Medema on the definition of economics. Or, to put it more bluntly, what exactly is economics anyway? Harvard’s Greg Mankiw simply says “Economics is the study of how society manages its scarce resources.” Pithy, to the point, possibly accurate, and consistent with what Robert Heilbronner tells us in The Worldly Philosophers. More on that later. Scarcity, choices, allocation, behavior, decision making — not exactly narrowing down our subject here, are we? Thanks to Mr. T for the tip. You can read the full piece here. And here is the citation: Roger E. Backhouse and Steven G. Medema. 2009. “Retrospectives: On the Definition of Economics.” Journal of Economic Perspectives, 23(1): 221–33. Backhouse, by the way, is one of the co-authors of our ECON DS-391 and Econ 601 books. So we’ll be hearing more from him in the coming weeks.